Picture this, lots and lots of pickles, and with that comes lots and lots of pickle juice..... Is your mouth watering yet? 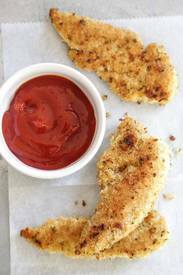 Skinny Taste has come up with a kid friendly, pickle lover friendly, mouth watering chicken tender recipe that you have to make. These will become a regular on your menu!